The prints made by fallen leaves on the sidewalk after a rainstorm inspired me to use leaves in paintings on Mulberry paper. One fine day, I brought one of my tempera paintings to an artist-run figure drawing session and drew the model on it. It was a ‘Eureka!’ moment. The drawing expressed something poetic about us and the congruences between our human selves and Nature. The visual congruences allude to deeper ones. The joining of arm to shoulder and of leaf vein to stem are similar. Nature makes a joint that moves, has nuance and pulsates with energy. Like the leaves on a tree, our aliveness is replete with water, air, and heat. Our blood runs along branching pipelines. Our feelings come from our gut. Thought itself moves through dendrites and across synapses. In the same way, sap makes its way through a tree. Some of our deepest imaginings come from the visual poetry of Nature seen again in Art. Why is it we separate our human selves from Nature? 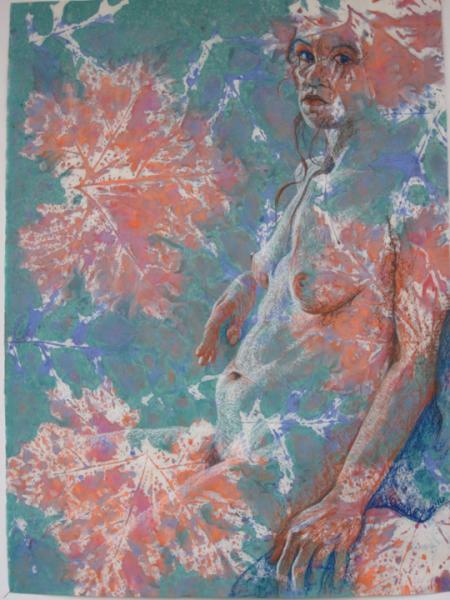 Like these nudes we are intimately wound up in Nature in the way we are built, the way we feel, and the way we think.